For certain situations, an ordinary backpack just won’t do. Whether you’re a hunter, a member of the military, or just a student that has an affinity for well-made and useful backpacks, sometimes the best tactical backpacks are simply the way to go. The best tactical backpacks generally have more space available and feature greater customizability than your average backpack. This makes them the perfect choice for backpack enthusiasts that want to upgrade to a professional-grade item carrier. Everyone’s definition of the perfect tactical backpack is different. 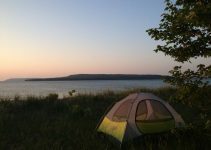 While some people are looking for an option that’s reasonably affordable but is still capable of carrying everything that they need, others aren’t afraid to shell out the big bucks to get a backpack with all the bells and whistles that will last the test of time. Tactical backpacks come in all sorts of colors, shapes, and sizes and run the gamut from sleek and stealthy to busy and stylish. When sorting through the options that are available, make sure to heed customer reviews of the different products you’re considering and compare pertinent features in order to ensure that you make the right decision. Different models of tactical backpacks have widely different features and attributes. Some backpacks are equipped with Modular Lightweight Load-carrying Equipment (MOLLE) panels on the side that allow you to attach accessories easily and with enhanced stability. In addition, certain backpacks are equipped with paracord handles that can be cut off in a jiffy and converted into a length of durable and useable rope. Other tactical backpacks contain hidden back compartments for storing documents and still others have water bladders for on-the-go hydration. The materials used in constructing tactical backpacks vary widely, with some more durable and waterproof than others. It’s certain that not all tactical backpacks are made equal and taking time to consider all of the features that are included with each option will help you ensure that you end up picking a backpack that suits your particular needs. Whether you’re in the market for a bug-out bag or a hunter’s best friend, sometimes tactical backpacks are the only way to go. Modeled after backpacks used by members of the armed services, these equipment carriers are the only option if you truly want to mimic the versatility of backpacks used in real tactical situations. With so many different options available, it’s easy to select a backpack that fits your budget and fulfills your needs. 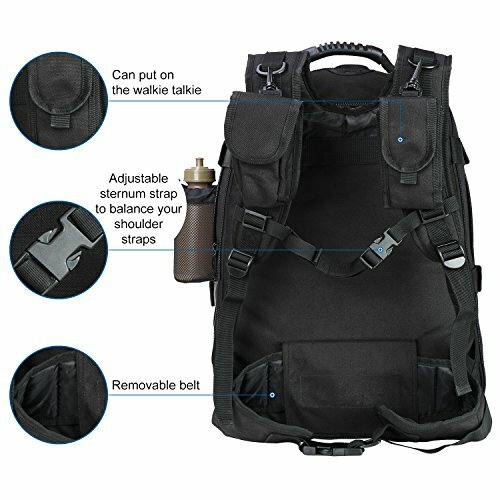 With this comprehensive guide, we will familiarize you with ten of the best-selling tactical backpacks on the market and fill you in on all of their notable features, benefits, and potential detractors so that you can make an informed decision that will satisfy all of your tactical backpack needs. This stylish backpack from Orca Tactical comes with a low price tag and tons of features. With dimensions of 11″ x 18″ x 2″, this backpack is given a size rating of 34L, making it one of the larger backpacks available on the market. Featuring two large zippered compartments in the middle and two smaller compartments sticking out from the front, the Orca Tactical SALISH 34L MOLLE 1 can hold pretty much anything that you may want to put in a backpack, from laptops to rifle clips to spare clothing. The main pocket features a mesh compartment that you could use to hold wet or dirty clothing on a weekend trip. The Orca Tactical SALISH 34L MOLLE 1 is constructed from durable 600D polyester that has been covered with a special coating for water and scratch resistance. Featuring top-notch YKK zippers that are resistant to rust, this tactical backpack is also equipped with two MOLLE straps, one on each side, that can admit any type of MOLLE accessory. There’s even a concealed compartment on the back and compression straps to make the backpack less bulky. While this product has received generally favorable reviews on Amazon, some reviewers have complained about poor quality materials and one reviewer even suggested that some of the positive reviews may be fake. One of the most attractive features of this affordable backpack is the 2.5-liter BPA-free water bladder that is included with your purchase. Featuring two smaller front compartments and two large main compartments, you can fit pretty much anything you may need for a 1 or 2-day trip into this tactical backpack. Available in 3 colors including camo, the 45L Large Military Tactical MOLLE Backpack mimics a real military backpack. 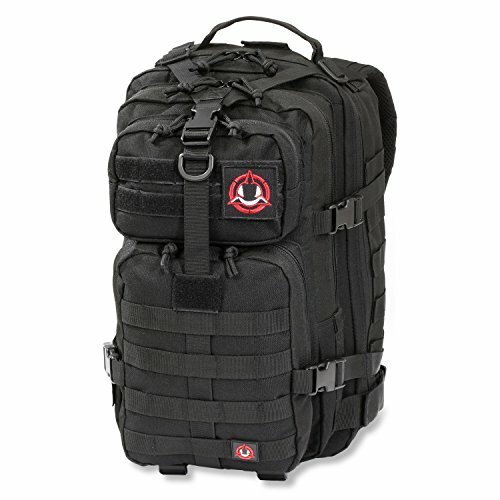 Rated 45L in size, this tactical backpack is quite a bit larger than many of its competitors. Paracord zipper pulls allow for effortless and noiseless zipper action and a 1-year warranty protects your purchase from defects and damage. Constructed from 600D polyester, the 45L Large Military Tactical MOLLE Backpack features a mesh pocket on the back, which is a significant departure from other backpacks that usually make use of a zippered pocket on the back if they include a pocket at all. The shoulder straps are fully padded and there are compression straps for maximum portability. This item has received generally favorable Amazon reviews, but some reviewers have complained about the poor quality of the materials used in its construction, which is to be expected from a backpack at this price point. This tactical backpack is relatively expensive and is available in 6 colors. It features a pocket designed for a water bladder and 3 main pockets for storage. The 5.11 Tactical RUSH24 Backpack is equipped with MOLLE straps on both sides for adding MOLLE accessories. This tactical backpack is constructed from 1050D nylon that has been covered with a water-resistant coating in order to keep its contents safe and dry. It even has a zippered water bottle pocket on the side and is equipped with compression straps. The carrying handle on top is heavily reinforced for enhanced grab-and-go capability and this tactical backpack even features a fleece-lined eyewear compartment for eyeglasses or sunglasses. Unlike some of the other options available, the 5.11 Tactical RUSH24 Backpack appears to have been constructed with high-quality materials, a reality that is, of course, reflected in the price tag. If you’re looking for a tactical backpack that won’t just look cool but will last you for years of service, it might not be a bad idea to shell out a little extra for an option that doesn’t cut any corners. Reviews of this tactical backpack are overwhelmingly positive. This tactical backpack is one of the cheapest options available and is also one of the most customizable with seven print colors available. 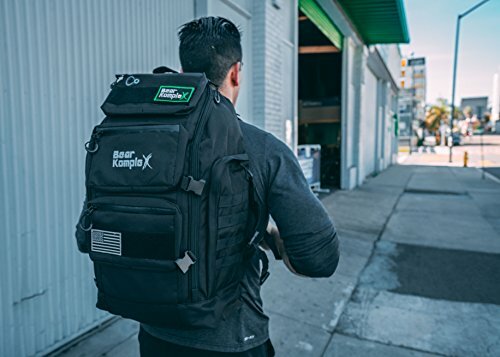 The WolfWarriorX Military Tactical Assault Backpack is advertised as being expandable, providing you with more room for carrying items on long trips. Constructed from 600D polyester, this tactical backpack is jam-packed full of pockets and hooks, with pockets on the straps themselves for smartphones or walkie-talkies and space on the side that’s designed for water bottles. There’s a mesh compartment on the inside for tablets or notebooks and there are even spots designed for tools or thumb drives. With so many features packed into this backpack, the overall appearance is somewhat busy and overwrought. Many less-expensive backpacks seem to pack excessive features to distract from poor quality, and with a price tag set lower than $50, one can’t help but wonder if this is the case with the WolfWarriorX Military Tactical Assault Backpack. The company that makes this backpack is based in Texas but no indication is given regarding the location of manufacture. The reviews of this product are favorable and appear to be genuine. This fancifully named tactical backpack from Direct Action is certainly up there in the price range, but this elevated cost appears to be backed up by high-quality and feature-rich construction. Available in gray, black, and desert camo, the Dragon Egg is constructed from Cordura 500D and is coated with DWR for maximum waterproofing and durability. 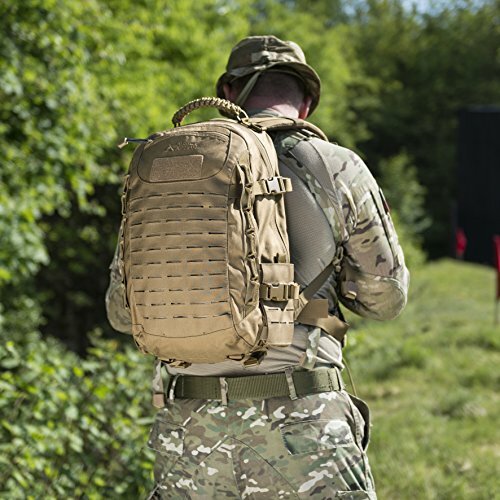 Unlike most MOLLE systems, which usually consist of horizontal elastic straps, the Direct Action Dragon Egg Tactical Backpack is equipped with laser-cut MOLLE hooks which vertically line both sides of the backpack. From the outside, this tactical backpack is beautiful and simple without any of the busy features that are common with lower-quality backpacks. On the inside, however, there are plenty of reinforced pockets and hooks for storing a variety of tactical items. There’s even a zippered back pocket that’s perfect for a laptop or concealed carry pistol. One of the most interesting features of the Direct Action Dragon Egg Tactical Backpack is that it is coated with various substances that apparently make it hard to see with night vision technology. Reviewers appear to love this product, with only a handful out of the nearly 300 reviews being negative. The RUSH72 backpack from 5.11 Tactical is designed to cover all of your needs for a 72-hour excursion. While it would be disingenuous to call this backpack affordable, it is clearly constructed from high-quality materials and features a simple and sophisticated design. Available in 7 different colors, the 5.11 Tactical RUSH72 Backpack is constructed from 1050D nylon for maximum durability and features dual density closed-cell foam shoulder straps that are adjustable to fit your frame. Equipped with a single main compartment, two front compartments, and a zippered hydration pocket on the side, the RUSH72 backpack also includes MOLLE straps along the side for hooking up tactical accessories. 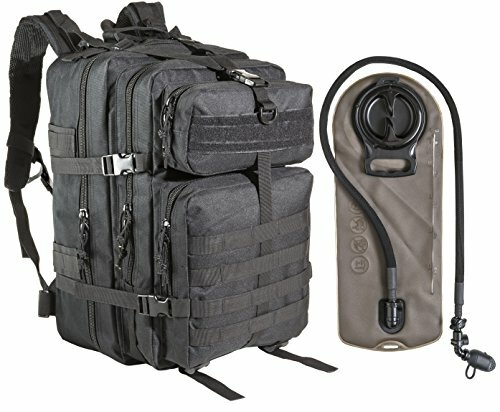 The total capacity of this tactical backpack is 55 liters and it is outfitted with a grommet for drainage and a fleece-lined pocket for eyewear. There are nearly 1,000 reviews of this product on Amazon and it has an overall 4.8-star rating. Negative reviewers note issues with zipper construction and weight distribution. The G.P.S. Tactical Range Backpack is a true tactical backpack. While it may not feature enough storage for a long trip, it will cover all of your handgun needs and then some. Zip open the side pocket to reveal three modular components that, at first glance, look something like old-school CD cases. But upon closer inspection, it is revealed that these three inconspicuous components are actually handgun cases, complete with elastic magazine holders. There’s also a top pocket for storage and two front pockets for accessories, but this backpack was obviously truly designed for tactical purposes instead of hiking or otherwise relaxing and enjoying the great outdoors. The G.P.S. Tactical Range Backpack is equipped with MOLLE webbing and a honeycomb frame for enhanced rigidity. One of the big benefits of this tactical backpack is that it is made in the USA, though one reviewer claims that it is actually made in China. The G.P.S. Tactical Range Backpack has an overall Amazon rating of 4.6 stars. This tactical backpack is the cheapest option on this best tactical backpacks list. It features two main compartments and one front compartment and is advertised as the “best backpack for any conditions”. 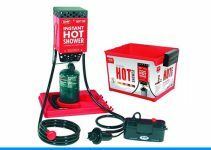 It has an overall volume of 40 liters and is equipped with various internal compartments for storage of electronic devices and tools. 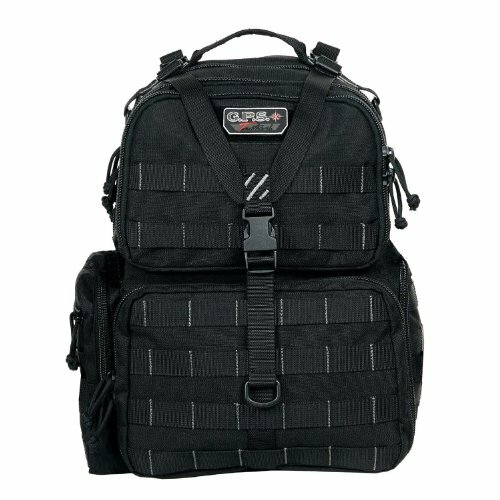 The Tactical Backpack by All With Me also includes a padded pocket for laptops and tablets. 100% of the reviews for this product are positive. However, when run through the review analyzer FakeSpot, the Tactical Backpack by All With Me received an “F” grade, indicating that many of the reviews may be fake or deceptive. It is always wise to tread cautiously when buying products from manufacturers that solicit fake reviews. This is a relatively expensive tactical backpack that is made in Vietnam and that is packed with a number of attractive features. It is equipped with MOLLE straps along the sides and contains two main pockets and two smaller outer pockets for accessories. 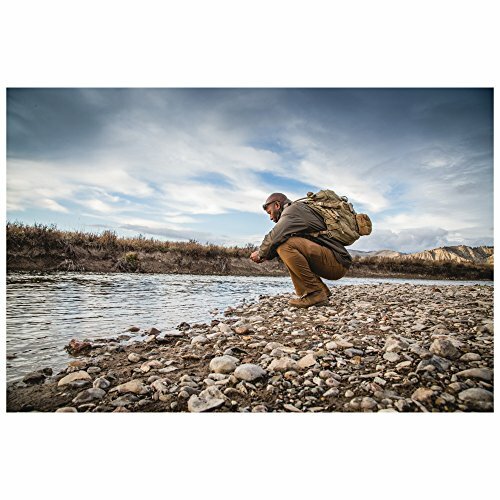 The Maxpedition Falcon-II Backpack is constructed from 1050-Denier water and abrasion resistant nylon and can accommodate two 3 liter water reservoirs. Designed both for camping and tactical situations, the total capacity of this backpack is 25 liters. It features both a waist and a sternum strap as well as compression straps on each side. 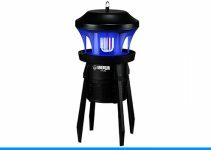 There are nearly 500 reviews of this product on Amazon and the overwhelming majority are favorable. Most of the negative reviewers don’t have legitimate concerns and are instead upset by the size, which is clearly listed. 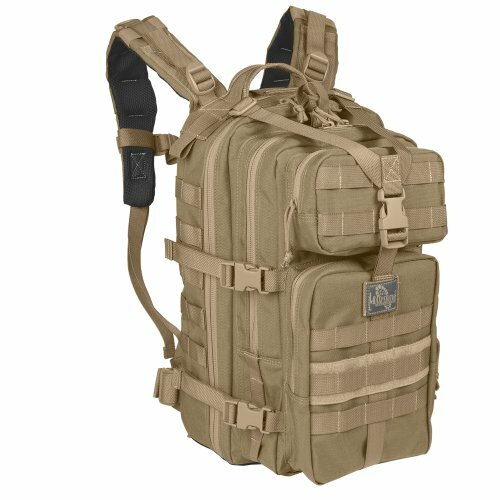 This unique-looking tactical backpack is in the mid-to-high price range and is constructed from 1000D nylon. It features one main pocket that zips all the way out and 3 accessory pockets on the outside of the backpack. The Bear KompleX Military 3 day Tactical Rucksack is also equipped with MOLLE webbing and a zippered back pocket for laptops or sidearms. 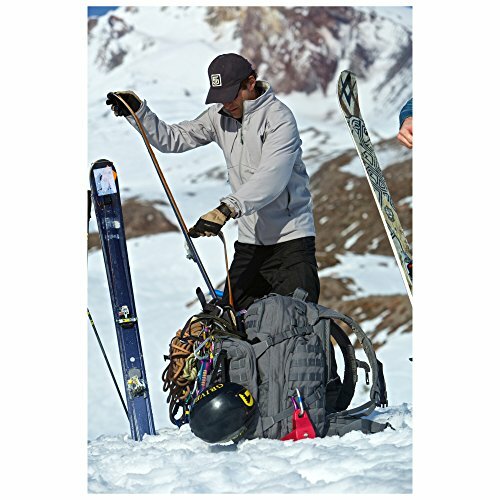 It features external compression straps and yoke-style shoulder straps as well as fleece-lined interior compartments and an admin area with hooks, loops, and small pockets. Coming from a company that also manufactures gym accessories, this backpack appears to be designed as a workout bag. The Bear KompleX Military 3 day Tactical Rucksack only has one review, making it hard to establish a baseline of customer satisfaction.